RAIN RAIN RAIN ! We Want heavy rains, this was the voice of Karachiites since the beginning of June and today they got what they were waiting since three full months. It was not the first rainfall of the current monsoon season but the first heaviest and proper monsoon rain of the city. 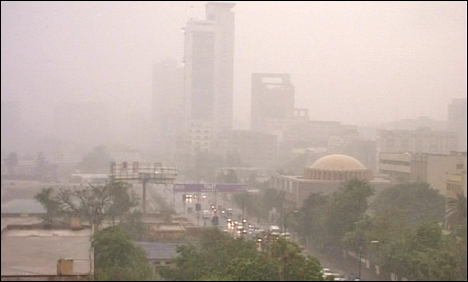 Despite many weather systems roaring towards Karachi, none appeared to cause any significant rainfall in the metropolis. When Karachiites started losing hope in the monsoon of 2011 and decided to wait for the monsoon of 2012, then the near-ending monsoon season realized that it had been unfair to the city and decided to pour heavy rainfall with strong lightening and winds in the city. Finally it rained heavily on September 6! Karachi was burning 24 hours back! Starting from September 3, when the low pressure was over Madya Pradesh and adjoining Rajasthan as it was shifting its course towards coastal Gujarat and adjoining Sindh via Rajasthan. Under that influence the city started attracting winds from north-eastern and northern parts of the region, thus the city kept getting desert like winds of Rajasthan till the low moved further close to the city and brought rainfall. Not unusual though! Temperature was 37°C on September 3 while 38.5°C on September 4 as well as September 5. Highest temperature was 36°C at about 12:00 pm, humidity was about 40% and sea level pressure was 1001 hPa . Skies were covered with high and medium level clouds since morning. Winds were mostly calm and in North-western direction since last few days. Winds kept changing direction; SW, NW, WSW winds were observed. Winds reached 55 km/h in some parts of the city. Rain bearing clouds came from North-eastern direction. Strong and properly visible lightening was observed. Lowest visibility was just 3 kilometres. 70 mm rainfall was recorded till 6:00 pm PKT. A Story of a low that took birth on August 28! It was a low pressure area that brought these downpour to Karachi, the remains of this weather system can be traced back to August 28, when an upper air cyclonic circulations formed in the Bay of Bengal over west-central sector. On August 29, the UAC moved to north-western Bay of Bengal and intensified into a low pressure area. The next day, it moved to Orissa coast, later on August 31 the low pressure moved to Chhattisgarh and keeping that direction and favourable conditions in mind, Pakistan Weather Portal (PWP) started monitoring the system due to its possible influence in Sindh. On September 1, the low pressure moved slightly towards south Chhattisgarh. The next day, it moved to Madya Pradesh, it remained stationary there for 24 hours however it moved slightly towards Gujarat and on September 4, it moved towards Rajasthan and adjoining Gujarat. On September 5, it moved further towards Gujarat and adjoining Sindh, on September 6, it intensified into a well-marked low pressure due to favourable conditions and moved slightly towards Sindh. It is expected to remain mostly stationary over Sindh-Gujarat border, it may move in a north-easterly direction and it is expected to significantly weaken from September 7. Flooding, Traffic jams, Electric breakdowns and now Robberies join the monsoon season? As soon as the rainfall started lashing the city, eletric breakdowns were reported in the city. Flooding also hit many parts of the city, small ponds were created due to the heavy downpour and some roads were also sub-merged under rainwater. Severe traffic jams was reported on I.I. Chundrigar Road, Shara-e-Faisal and other busy streets of the city. There were also reports of some damage to trees due to strong winds in some parts of the city. But the most astonish thing that have been witnessed in the city was that theives started snatching mobile phones and other valuable things during the time of traffic jams due to rainfall. Amazed or just an ordinary day? pata nahi kiya ho ga is mulk ka,yahan k log kaisai ho gai hain,majbur logon ko bhi nahi chortai…. @ K.M, Do you expect rains on today in KHI? 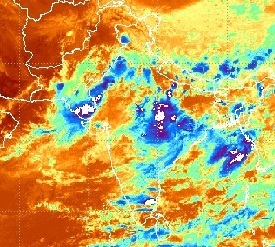 not like tomorrow, thunderstorms as of now mostly moving to south-eastern Sindh..
what is that blue blue in below image? i was thinking that these are clouds which are filled with water and these will cause rain and the clouds in black have no water in them so they will cause no rain. am i right ? will it rain today heavily like yesterday?????? We get more than 20 times above 50 mm in lahore this moonsoon but no robbery, why it always happen in karachi. @ K.M, There are cloud but not raining in KHI.Why? According to Satellite also it seems that thunderstorms targated areas are Eastern Sindh. As far as my little knowledge about clouds and climate goes, i can see Karachi might receive another spell of shower on Saturday morning/afternoon or it may be possible the activity will start from Friday night.